But the treasures so far have been the walks, the unknowns, the selection at the Carrefour and in the markets, the conversations I’ve managed to have in extremely broken French and their excellent English with the woman in the Montmartre shoe store and the owner of the wine store in the 11th, with an Uber driver we had today when the boys could not walk another step, and with the man toggling this evening between my fresh crepe and the Lebanese meal he was preparing a emporter for a local. The treasures, for me, are when I feel connected. Not as an obvious tourist, which is one of my least comfortable sensations and one of the things I most avoid, but as someone with even a toenail inside a place, a culture, a way of life. Perhaps it’s not connection; perhaps it’s a sense of peering behind a veil I’ve just ruched to the side. Then again, pulling away the screen of disconnection allows for interaction with its antipode; I crave such experiences. I will make and take them whenever I can. Yesterday, near the Rue des Rosiers, traditionally an artery through the Jewish part of town, there was a lesbian bar directly across the street from a kosher butcher. Today, we pilgrimaged to a cave for a specific bottle of wine. The Uber driver’s name was Mohamed Ali, not even kidding. He drove through one of the most severe traffic jams I have seen; in fact during it, I learned the phrase for rush hour but also the French, which I cannot relay in words here, for many roads bottle-necking into one. Why were we schlepping to the 11th for wine? Well, we had emailed the L’Ove winery after enjoying a glass of their white the other night and were told that Le Sourire au Pied de l’Echelle (literally the longest wine store name I have ever encountered; it means ‘the smile at the foot of the ladder,” referencing a wine-maker’s ladder to access the tank…). We walked in, I asked for the wine and also a bathroom for Ol who was code red in need, and Tom and I ended up having a delightful talk with the owners of the store who seemed surprised but happy that we knew of the wine and had made a trip for it. The point is that my photos of (the incredibly fantastic) street art here, and the lost meanderings through Paris’ neighborhoods, and the food tour, and the cave, and falafel and Mohamed Ali, and the lesbian bar sharing immediate real estate with the kosher butcher are as valuable as seeing Winged Victory and Liberty Leading the People in the Louvre and summiting the Eiffel Tower and appreciating the flying buttresses at Notre Dame. What binds all of that jumble is those who have created it, past, present, and future. It is the glue of togetherness, of forcing stickiness even when the adhesive was sometimes old, dry, unwanting, and frail. Don’t get me wrong. France has its problems. Hallo, Marine Le Pen and youth unemployment and shootings. I’m not arguing France vs America. And I’m not talking about over-zealous evangelism which, in my opinion, is repugnant in any presentation. I’m making a point about the mad richness that comes from a thrilling diversity of people and backgrounds and culinary and artistic traditions. From acceptance and the vibrant sardine’ness that cities force. I’m making a point for all who have fought to be recognized and valued; their courage and fight bring vigor and newness to places in the most enlivening ways. Against the glory of Bourbons and Napoleon and kings butts the glory of the Third Estate and exiles and immigrants and poets and outsiders. The winemaker at L’Ove is a woman, Céline Oulié, who has faced and pushed forcefully back against the old, male, established “right way” of doing things. Her wine, her way, is spectacular. The Eiffel Tower was first considered a heinous eyesore of embarrassment; today it is a beloved marvel. Pushing the limits advances us all; recognizing the potential in others, same and different, opens the world to infinite possibility and growth. That, to me, is the point of travel. It is why I consider travel to be the ultimate education. It is why the top tens are of value but also why leaving those behind is as remarkable. If you ever see it, buy and drink it! 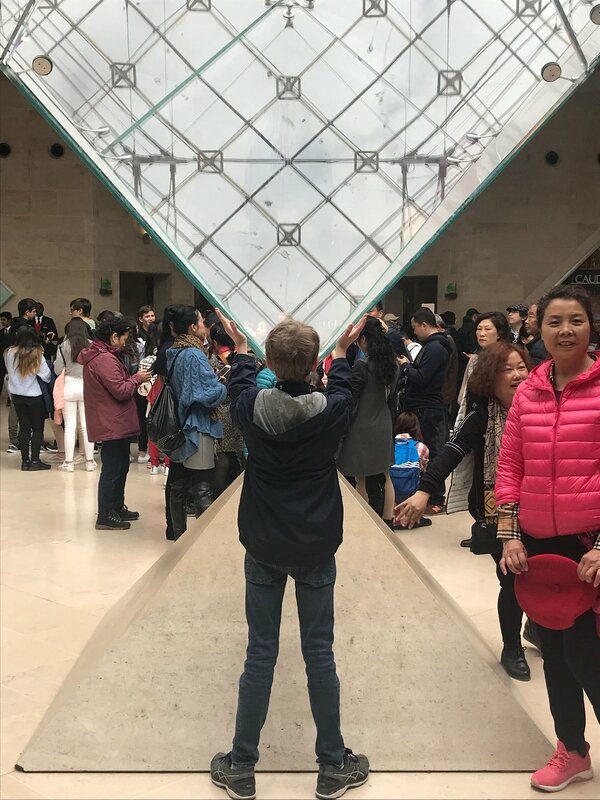 As Paris is utterly spectacular and noisy and vibrant and expansive and cozy and full of cheese and baguettes and street art and epic works of art and a river and traffic jams and music and old people and children hand in hand, we are having a grand time. More details later, but for now, pictures.